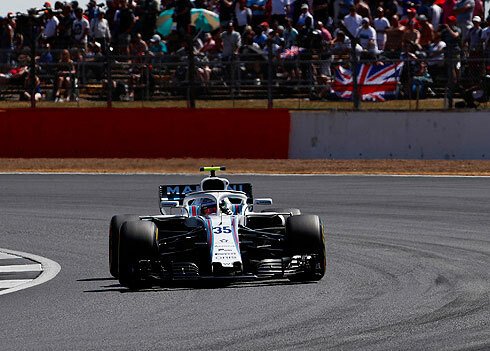 After an encouraging opening Friday practice at the 2018 British GP the Williams Martini team would again fail to continue this form in the second session. In the first session Lance Stroll would finish in 10th but in the second he could not match this and would drop to 15th. The situation for his team-mate Sergey Sirotkin was little better but at least he did not have any issues during the session but could only manage 16th. The one enjoyable thing from the day was the appearance of Frank Williams at the Williams garage. The first time of the second session at Silverstone would come from Vandoorne with a 1m:31.522. Quickly other drivers would go quicker with Leclerc now fastest with a 1m:31.085 using the medium tyre with Alonso second followed by Magnussen. Raikkonen was now fastest with a 1m:29.664 followed now by Vettel. The majority of the drivers were on the medium tyre with Leclerc now third followed by Ocon, Alonso, Vandoorne, Gasly, and Ericsson eighth. Vettel would go quickest with a 1m:28.856 followed by Raikkonen and now Ricciardo. Verstappen would go off at the same corner that Sergey had gone off at in the first session. His car would hit the barrier with the rear. This would see the session red flagged as they needed to recover his car. The session would restart with Raikkonen currently fastest with a 1m:28.591. While in their pits the Williams drivers were currently 15th and 18th. Hamilton and Bottas were now third and fourth. Ricciardo would move ahead of Bottas using the medium tyre while Bottas was on the hard. Raikkonen would improve with a 1m:28.525 using the soft tyre. Hamilton was second but still on the medium tyre. Leclerc was now up to fifth ahead of Bottas and his team-mate Ericsson in seventh. With their soft tyre runs we would now have the Williams drivers in 9th and 10th. Vettel using the soft tyre and would set a 1m:27.552 to go fastest. Bottas was now second followed by Raikkonen and Hamilton. 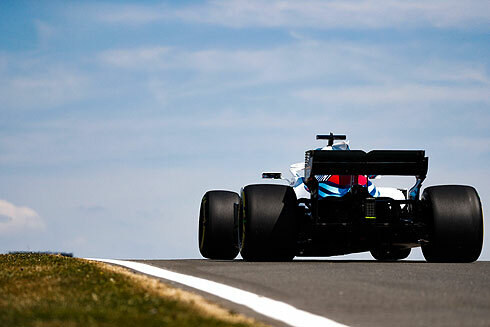 The Williams drivers would drop to 15th and 16th as others went quicker. Hamilton on the soft tyres was able to move into second behind Vettel. Both Williams drivers were on longer runs on used soft tyres. Reports had the Williams team using a new rear wing at this race. Both drivers would pit and would return with one on the medium tyre and the other the hard. The rest of the session would see the teams work though longer runs on various tyre combinations. The session would end with Vettel quickest from Hamilton, Bottas, Raikkonen, Ricciardo, Alonso, Hulkenberg, Ocon, Perez and Leclerc tenth. 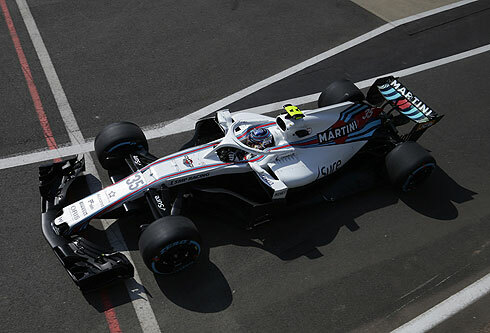 The Williams drivers would remain in 15th and 16th with Lance not been able to match his pace from the morning session. Sergey was able to get through the session without and issues. As was the case in the first session the drivers were able to complete practice starts. After a short delay Lance would follow his team-mate out running on the medium tyre. Lance would set a 1m:40.262 in what was a very slow lap but his next lap would see a 1m:31.491 to see him 10th. With the red flag Lance would pit currently 13th. He would drop to 17th and would also return using the soft tyre. Lanc3e would set a 1m:30.190 to be 10th. Lance would improve with a 1m:30.069 to move into ninth pushing his team-mate down one place. Lance would drop to 11th behind Ericsson. This would become 13th as he pitted after a seven lap run. In the pits Lance would drop to 15th. Lance would also come back out running on used soft tyres. Lance would run wide at Turn 13 slightly going off track. His engineer would tell him to control the speed in the turns prior to that. Lance would pit having completed 17 laps on the soft tyre returning now on the medium tyre. Sergey would come out early in the second session running on the hard tyre. Sergey would set a 1m:33.717 which was already faster than that he achieved in the first session. He would drop to 12th as more drivers took to the track. Sergey would improve with a 1m:32.225 to be tenth but he would again drop down the order to be 13th. Sergey would continue to lap on the hard tyre but with the red flag he would also pit currently 16th. Sergey would return on the soft tyre currently 18th and his first lap would see a 1m:30.816 to see him move up to 12th. Sergey was able to find even more time setting a 1m:30.103 to be 8th. He would drop to ninth to be one place ahead of his team-mate. But Lance would improve seeing Sergey drop to 10th. Sergey would pit currently 12th after a seven lap run on the soft tyre. He would lose another place to be 13th. In his pit he would drop to 16th. With thirty minutes remaining Sergey would return on used soft tyres. Sergey would also pit after a total of 17 laps on the soft tyre returning on the hard tyre.